A national bestseller, the story of “a boy’s last days of youth and a history his father can’t leave behind” (The Daily Beast). Tom Harry has a streak of frost in his black pompadour and a venerable bar called The Medicine Lodge, the chief watering hole and last refuge in the town of Gros Ventre, in northern Montana. Tom also has a son named Rusty, an “accident between the sheets” whose mother deserted them both years ago. The pair make an odd kind of family, with the bar their true home, but they manage just fine. Until the summer of 1960, that is, when Rusty turns twelve. Change arrives with gale force, in the person of Proxy, a taxi dancer Tom knew back when, and her beatnik daughter, Francine. Is Francine, as Proxy claims, the unsuspected legacy of her and Tom’s past? Without a doubt she is an unsettling gust of the future, upending every certainty in Rusty’s life and generating a mist of passion and pretense that seems to obscure everyone’s vision but his own. 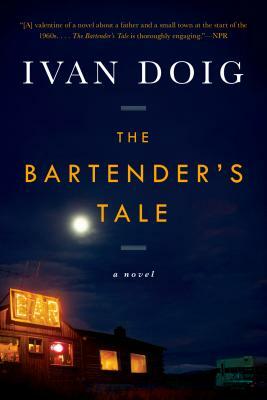 The Bartender’s Tale wonderfully captures how the world becomes bigger and the past becomes more complex in the last moments of childhood. Ivan Doig is the author of ten previous novels, most recently Work Song, and three works of nonfiction, including his classic first book, This House of Sky. He lives in Seattle. Theatre plays a great part in this story, with Rusty and Zoe initiated into the mysteries of the stage via the amateur actress Mrs. Reinking and their own forays into comic “bits.” What are the two adolescents learning about character and contrivance? How does the theme of performance and pretense underscore the dramas of the novel's “real” dramatis personae – especially Tom, Proxy, and Francine? Why do you think Doig decided to set this novel at the dawn of the 1960s? How does he signal the cultural upheavals to come? What connections do you see between Rusty’s loss of innocence over the course of the novel and the cultural moment in which it takes place? The plot is aswirl with various adult pairings, past and present, real and imagined—Tom and Rusty’s mysteriously vanished mother, Tom and Proxy, Del and Francine—seen through the young eyes of Rusty and Zoe. What do you think is Doig’s stance toward love? Why doesn’t he give any of the couples a conventionally happy ending – except, we discover, Rusty and Zoe? Del’s Missing Voices Oral History project is based on the Federal Writers’ Project – a WPA program that sent writers across the country to, among other things, collect oral histories from various remote regions of the country. How does Doig carry on this tradition in his own writing? The parent-child relationships in this novel are freighted with baggage from decades past. In what ways does Doig visit the “sins of the fathers” (and mothers) on their offspring, and in what ways does he absolve them? The Medicine Lodge plays a unique role in Gros Ventre, functioning as hub of the town’s social life and showcase for a pageant of human quirks and contrariness. What are some examples? What contemporary institutions function in a similar way? Though this novel is set in the early 1960s, its characters are shadowed by of the Great Depression. Why does Doig pair these two time periods? How do they resonate with today’s dilemmas? The Bartender’s Tale features a memorable collection of supporting players, some of whom are inanimate objects: Igdrasil the tree, the Gab Lab, and the various treasures in the back room of the bar. What kind of role do these “characters” play in the story? Can you think of other authors who use this technique? Doig introduces a great deal of suspense into the story over the identity and whereabouts of Rusty’s mother, yet he chooses not to introduce her directly into the story or to clarify much about her until the end. What do we learn from Rusty’s efforts to fill in the gaps in his and his father’s history? Were you surprised by Francine’s behavior at the end of the story? Why do you think Doig chose to give her the fate he did?